There is a great deal happening in the world of things at present: 3D printing technologies are enabling new construction and manufacturing methods of complex objects and the production processes are changing the aviation and automobile industries, medical technology, design and architecture. We visited the Euromold trade fair in Frankfurt/Main to track down the most exciting new developments. 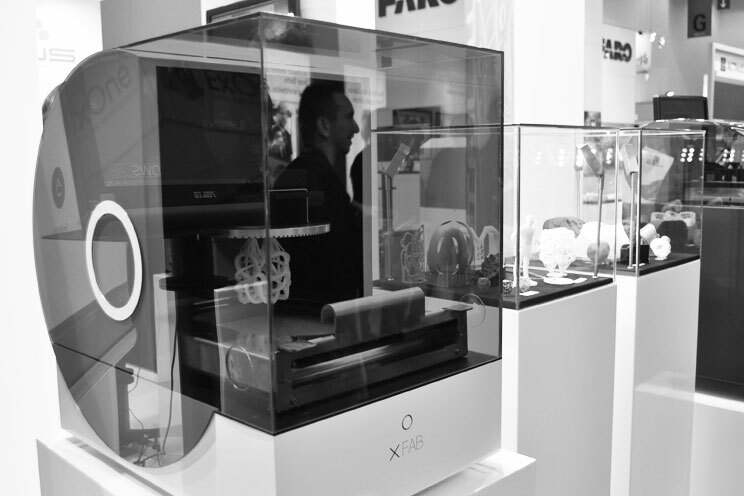 In Hall 11 of the Frankfurt trade fair grounds floor-to-ceiling machines by market leaders such as Stratasys, EOS, SLM Solutions and 3D Systems are humming – demonstrating the full panorama of 3D printing potential. Yet smaller suppliers were also present, including Makerbot, whose 3D printers are currently causing a real stir among end consumers and designers, 3D scanner manufacturers such as 3D Shape, service providers like Renishaw offering additive job order production and research institutes such as the Fraunhofer Institute or Direct Manufacturing Research Center (DMRC) from the University of Paderborn. The sector is benefiting from the media hype surrounding 3D printing – which is also evident from the fact that not only engineers and IT specialists, but also designers and architects are crowding around the booths. One striking example of the expansion of 3D printing towards the series production of complex components is provided by General Electric Aviation, which is currently switching over an entire plant in the state of Alabama to EOS printers. It aims to series produce 40,000 injector nozzles for airplanes such as the Airbus A320 there in the coming five years. Indeed, thanks to the improved technology of additive manufacturing, objects with cavities or lattice structures can now be produced extremely precisely. At the same time production costs for components are sinking and technical modifications can be directly carried out. 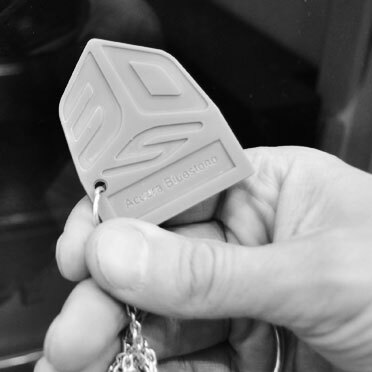 Whereas aviation and large-scale industry are having complex metal components printed using such methods as selective laser melting (SLM) and selective laser sintering (SLS) or laser deposition welding, in the automobile industry 3D printing has to date primarily been used for building plastic prototypes. 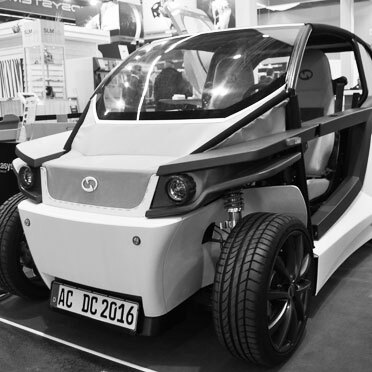 For instance, at Euromold RWTH Aachen presented its car “StreetScooter C16”, whose components made of photopolymer acrylic resin plastics were produced using the “Objet1000” printer by US company Stratasys – currently the largest PolyJet printer on the market, able to produce up to three different plastics using the Connex method and at sizes of 1000 x 800 x 500 millimeters. The vehicle components produced in this way, including doors, front spoilers, side skirts and wheel arches, were able to be made faster and cost significantly less than cast components. As such, the engineers from RWTH Aachen pride themselves on having brought their roadworthy “StreetScooter C16” from sketch to street in just nine months. New in the field of plastic prototype construction is the development of material mixes such as could be admired at the booth of American supplier 3D Systems, for example. The firm now offers the patented epoxy resin “Accura”, which when mixed with ceramic grains is more stable than conventional plastics suitable for 3D printing and has already passed Formula 1 wind tunnel tests. The market for 3D printing is currently booming particularly in the field of dental medical technology. The reason is obvious: This sector requires the production of highly precise and individually customized tooth implants. That which used to be painstakingly shaped, milled and adjusted by hand by dental technicians is now scanned, printed and perfectly implanted, for instance titanium bases for crowns or crown copings made of zirconium oxide ceramic. A printed crown coping could be series produced for three to four euros (naturally if enough are made) we are told at the booth of German plant manufacturer EOS, market leader for additive manufacturing in metals and for 3D printers costing 400,000 euros upwards. Given this investment sum, it follows that only large dental labs can afford a 3D printer. The research conducted by the Fraunhofer Institute is no doubt also interesting for medical technology. 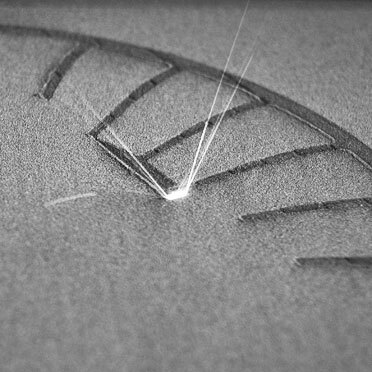 The engineers from the Fraunhofer Institute for Laser Technology (ILT) in Aachen are investigating even smaller structures using metal SLM: By means of a novel pulsed melting method, they can produce microstructures less than 100 micrometers. In addition, the Fraunhofer engineers are working on expanding the size of the construction space for metal printing and to this end presented a print head with five diode lasers that can be mobilized on several axes and consequently enlarges the working area. Compared with what is possible in medical technology, in the world of lifestyle brands and consumer goods the application of 3D printers is still in its infancy. 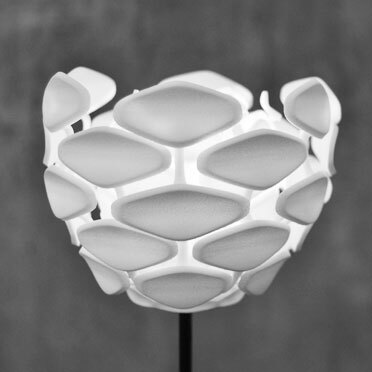 The Belgian company Materialise and the German service provider Cirp, which offer additively made furniture and luminaires, are just some budding examples here. Under its Purmundus brand, Cirp sells laser-sintered plastic luminaires, which are already stocked by as many as 50 retailers. Priced at around 350 euros, they impress with amazing mechanical functions, for example a replica petal that opens up to emit the light further. This is yet another advantage of 3D printing in design as it means that mechanical functions too can now be printed directly. 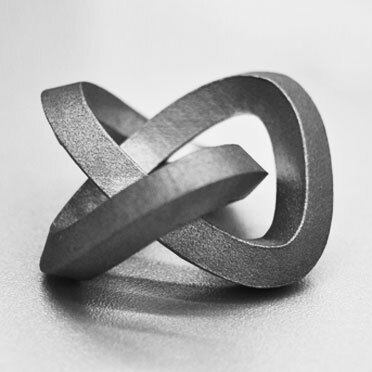 The jewelry industry is likewise discovering the benefits of 3D printing. Companies such as Chopard are making use of stereolithography printers on a major scale, while the Italian company DWS includes a special small printer for goldsmiths in its range – priced from 10,000 euros. However, gold and silver items are not printed directly, meaning that jewelers work with plastic prototypes as molds. Another very exciting creation heralding the design of tomorrow is “Cellular Loop”. 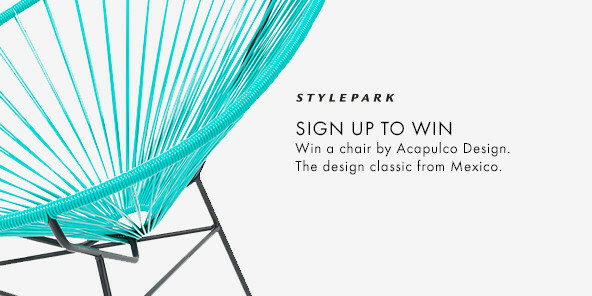 The chair with the futuristic shape is the brainchild of a collaboration between the Fraunhofer Institutes UMSICHT and IWM and Folkwang University of the Arts. For its development, the designers used bionic construction principles which they subsequently transferred to the furniture item. 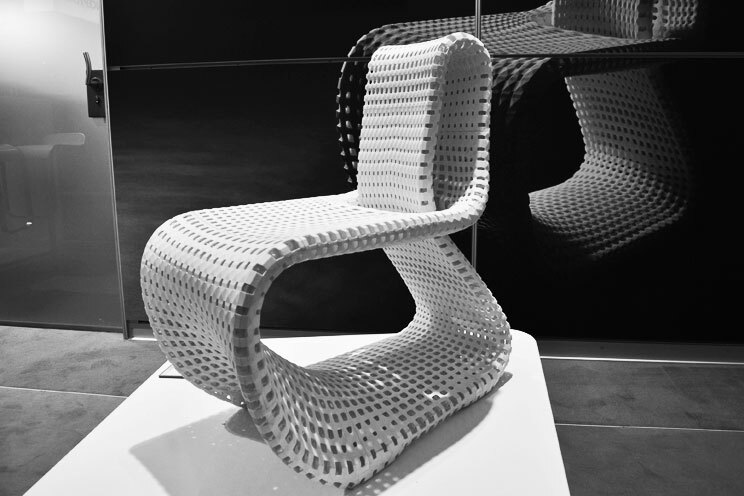 The resulting chair consists of a honeycomb structure that consolidates when pressure is placed upon it, using the same construction principle as bones, for example. Offering a design that is not only more precise, but also uses less material. Architects will find this technology very exciting: MCor Technologies from Ireland presented a 3D printer that cuts models out of paper – the next step up from laminated object modelling (LOM). Single sheets of paper are fed into the printer one by one and glued together where necessary. The result: small and extremely lightweight models that, as the manufacturer says, are very “ecofriendly” because no plastics are used. Yet the main benefit is in cost saving: The system works with ordinary paper – even if the machine itself costs a whopping 34,000 euros. The need for expensive materials that users are obliged to purchase along with 3D printers has become obsolete. 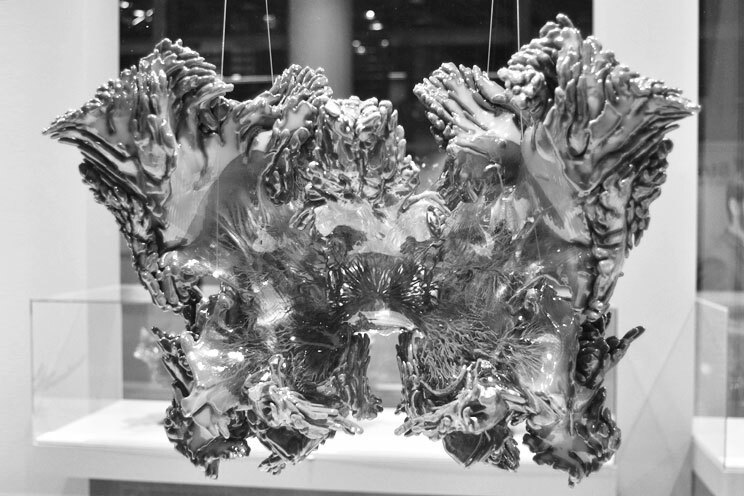 Neri Oxman, Director of the “Mediated Matter” research group at Boston’s Massachusetts Institute of Technology (MIT), presented “Wanderers” at Euromold. Inspired by the world of flora and fauna, these items of clothing are destined to enable human beings to live on inhospitable planets such as Mars, Jupiter and Mercury, and on the Moon. 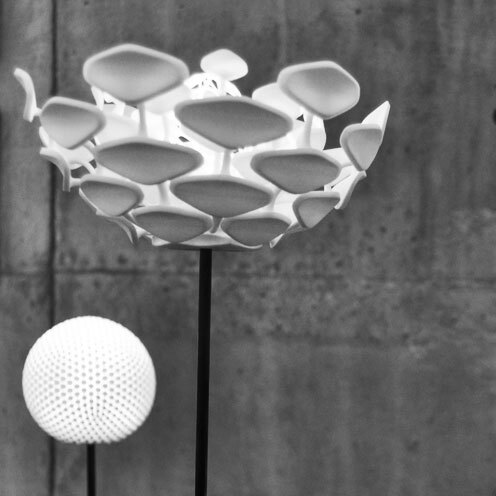 Oxman compares 3D printing technologies that are based on additive construction principles with organic growth. At the moment the capillaries of her “wearables” are still made of acrylic photopolymer resin and the integrated biological processes a merely hypothetical concept – but attempts have already been made to print organic tissue. Following our visit to Euromold one thing is clear: In aviation, large-scale industry, the automobile industry and medical technology the foundations have been laid for serial production with additive technologies. By contrast, these cutting-edge manufacturing methods are still too expensive in the consumer goods market. And yet, many exciting possibilities are opening up for engineers and designers, and no one knows where this journey will take us next – just like Neri Oxman. Despite the current hype about 3D printers for end consumers (available from 500 euros) production is a long way off from making its way from the factories and into our living rooms. This too was evident at the show. According to an expert, it’s not until giants such as Siemens make their spare parts construction plans available on the Internet and end consumers begin to familiarize themselves with CAD programs that this market will really take off. Right now the world of 3D printing tends to be populated more by technology nerds. But that’s going to change. 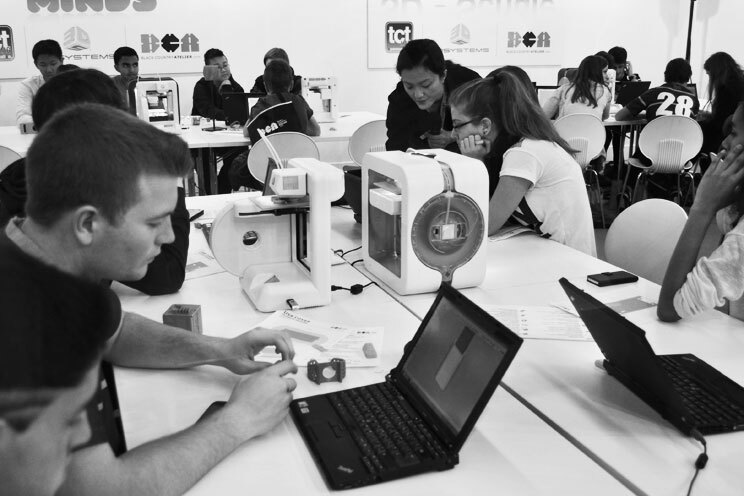 The trade fair offered a 3D printing workshop for kids and youngsters. And who knows, learning to use this technology might be on the schools’ curriculum soon, and for the next generation the 3D printer will be an everyday object just like the computer is for us today.